While reviewing your account, we noticed that your activity involves the trading or transfer of cryptocurrency which is prohibited under our Acceptable Use Policy. As this is not permitted on the PayPal platform we ask that you cease any activity that results in the trading or transfer of cryptocurrency. If you continue to engage in this activity on PayPal, we'll be unable to continue offering our services. You can view the complete PayPal Acceptable Use Policy by clicking the 'Legal' link at the bottom of any PayPal page and clicking 'PayPal Acceptable Use Policy'. This mailbox isn't monitored and you won't receive a response. For assistance, log in to your PayPal account and click Help at the bottom of any PayPal page. The initial email to and from looked genuine. However looking at the headers repeatedly revealed the domain mkts2944.com as the originating domain. Who is mkts2944.com's registered to ? is it Paypal or some dubious scammer? IBM! The sending domain is registered to big blue IBM! Well that's a new one! IBM sending spam FUD attacks against crypto currencies, so no wonder the crypto crowd has been thrown into panic given that the email appears genuine. There's not much out there on mkt2944.com however it suggests that someone has rented an email sending service from IBM to send out this mass mailing to paypal customers. Which leads us to the next big question. How did they get millions of PayPal customer email addresses? Anyway the email is FAKE, it did not come from PayPal instead it appears to originate from an obscure domain registered to IBM. So the next step is to log into my PayPal account and as expected there are NO warnings, therefore I am 85% certain at this point in time that this was a sophisticated FAKE email! The alternative 15% is because unfortunately PayPal cannot be trusted 100% i.e. they have been known to shut people out of their paypal accounts for feeble or even NO reason. But at this stage given that I have never transacted in a crypto via Paypal, then I am 85% certain this is a sophisticated FAKE PayPal warning. The alternative could be that somehow someone paid me via a cryptocurrency through a third party and that is the trigger for this warning. Or that a paypal algorithm has deemed one ore more transactions involve cryptocurrency trading. Though without any message on my Paypal dashboard I currently give this a low 15% probability. 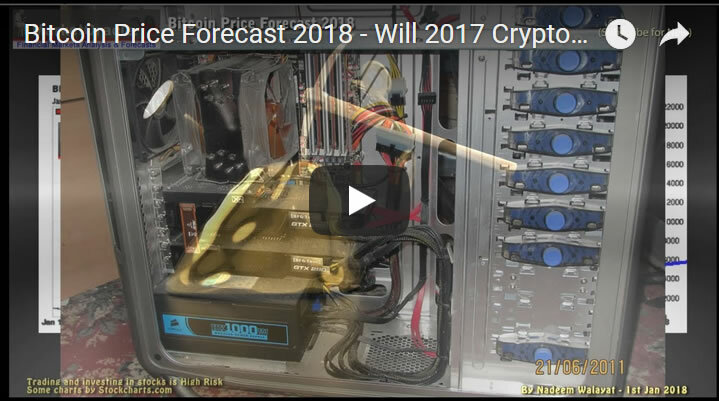 My forecast expectations at the start of the year are for the bitcoin price to spike down to a low of $5,000. Whilst my update of early February stated that the Bitcoin price could go even lower than $5000 before hitting bottom i.e. slice through $5000, then $4000, $3000 and could even trade as low as $2,000. The Bitcoin price of $8,000 is virtually where it was at my 5th Feb update of $8,075. However that price belies a lot of price volatility during the past 6 weeks which saw two rally's to $11,750 which gave much false hope to the crypto crowd only to be dashed as Bitcoin since the start of March has reverted to the downside, putting Bitcoin back to where it was over a month ago. 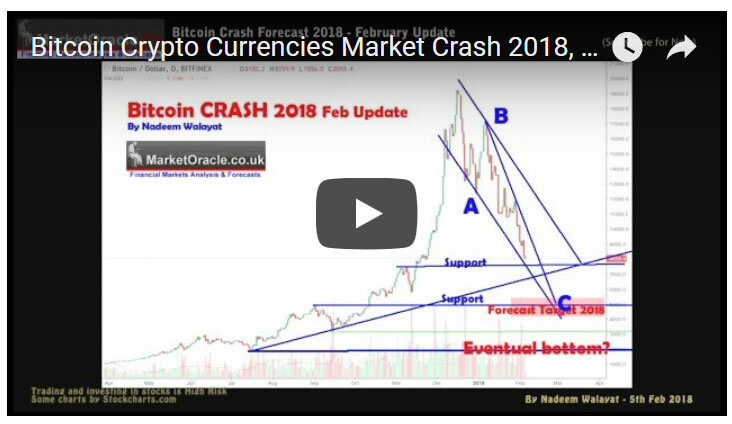 Support - is between $5000 and $6000, so a spike down into that zone is still the most probable forecast outcome for 2018. Resistance - is now at the recent high of $11,750. Trend - Despite the Feb rally the trend trajectory remains firmly down that continues to target at least $5000 and probably a trend down all the way to $2000. Elliott Wave - Implies we are currently in a corrective Wave B, of an ABC bear market. Which means we still have a Wave C to go which means lower lows i.e. to below $6000. So elliott waves also confirm my long standing bearish expectations that the Bitcoin price could spike to below $5000, maybe as low as $2000. The bottom line is that despite the February rally to $11,750 and the Bitcoin price currently being where it was when I last analysed it, technically nothing much has really changed and so the Bitcoin forecast remains in tact for first $5,000 to be achieved to be followed by a panic spike lower that could see the Bitcoin price trade to as low as $2000, something that few today can even imagine as I am sure the crypto crowd out there will label this analysis as just another FUD operation.